Live blog on RTÉ.ie and the RTÉ News Now App from 2.30pm Sunday. There are county finals right across the weekend, beginning with the replay of the Wicklow decider between Rathnew and St Patrick’s on Saturday afternoon. A late Shane Murley leveller saved St Pat’s against the reigning champions last day out but whoever triumphs won’t have much time to celebrate – the winners will face Offaly champions Rhode in the Leinster first round less than 24 hours later. Also in Leinster action are first-time Wexford champions Shelmaliers, who face Meath winners Dunboyne. Mullingar Shamrocks reward for stopping a four-in-a-row by St Loman’s in Westmeath is a tie against reigning provincial kingpins Moorefield. The Kildare men staged a memorable comeback to beat Loman’s in the final last year. In Clare, the winner could be rare. Ennistymon are contesting their first final since 1943, which was the occasion of their sole victory. Standing in their way are St Joseph’s Miltown Malbay, who claimed their 13th title in 2015. It’s a blast from the past in Cork as Dulhallow and St Finbarrs meet in the final for the first time since their double dates in 1990 and ’91, both of which were won by Duhallow. The divisional side haven’t claimed the Andy Scannell Cup since and the Barr’s wait goes back even longer, to 1985. Cork captain Ian Maguire lines out at midfield for the city club. Mountbellew-Moylough will make their latest attempt to try and stop the Corofin juggernaut in Galway. The All-Ireland champions are going for six in a row and two of their five wins came against this year’s opponents (2015 and 2017). The margin of victory was 10 points on both occasions so the underdogs will hope they can at least narrow the gap. In Kerry, the final has been overshadowed somewhat by the brawl that broke out at the end of the semi-final replay between Dingle and East Kerry. Dingle selector Colm Geaney will not be on the sideline after being hit with an eight-week ban for striking an East Kerry player. Crokes, who are going for three in a row, can pass out Austin Stacks at the top of the county roll of honour with victory. Colm ‘Gooch’ Cooper will be hoping for longer on the pitch than his black-card punctuated 18 minutes in the semi-final. Crokes were 1-18 to 1-08 winners when the same sides met in the ‘club’ final in April. In London, holders Fulham Irish will aim to capitalise on their late escape last week when they needed a free from former Tyrone star Owen Mulligan to force a replay against Tir Chonaill Gaels. The Donegal club are making their sixth consecutive final appearance but have lost the last two. Ardfinnan will contest their first Tipperary showpiece in 13 years. The village side were threatened with relegation early in the season but subsequently brought in former Tipp, Roscommon and Wicklow manager John Evans as coach and have since gone on a fairytale run to the final. Their opponents are heavy favourites Moyle Rovers, whose last win came in 2009. The Nire will hope that their recent history of winning the Waterford championship in even years (2000, ’06, ’08, ’14, ’16) is repeated against Kilrossanty. The Rossies are making their first final appearance since 2000, and have lost three since their glorious run of five titles in the 1980s, but dethroned champions Stradbally in style (2-13 to 0-12) to get here and won’t lack confidence. Depending how their hurlers fare on Sunday, Kilmacud Crokes could be going for the Dublin double on the Bank Holiday. The seven-time winners last won the football in 2010 and are up against another southside outfit, St Jude’s, who are competing in just their second final. 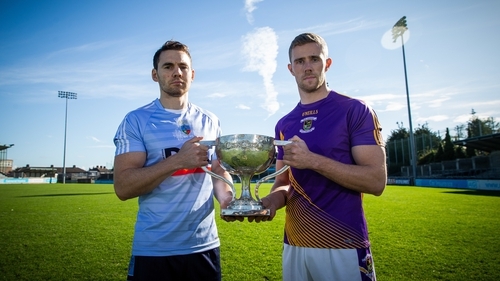 Kilmacud can call on the services of Dubs stars Paul Mannion and Cian O’Sullivan and are favourites but Jude’s, who feature Kevin McManamon, won the last championship clash between the sides in 2016 and ended St Vincent’s three-in-a-row bid on a 2-11 to 0-08 scoreline in the last four. Cork's Mourneabbey are chasing five-in-a-row in the Munster ladies SFC. The All-Ireland runners-up face Ballymacarbry of Waterford, who they defeated in the final last year and in 2015. Last year’s All-Ireland finalists Na Piarsaigh are in action on Saturday evening – they are in line for a fifth Limerick SHC crown in seven years. Standing in the way of Shane Dowling, Mike Casey et al are Doon, competing in just their second final and first since 2000. They’ve yet to get over the line. The city side are understandable favourites but Doon have their own county big guns in Richie English, Pat Ryan, Darragh O’Donovan and Barry Murphy. Earlier in the afternoon, 2017 runners-up Raharney meet Clonkill in the Westmeath final. Brendan Murtagh retired from county duty last year after 16 years in maroon and white but captains Clonkill in this one, a repeat of the 2015 and ’16 finals that were shared between them. Raharney won the group stage meeting in July 1-23 to 2-14. On Sunday, 2012 All-Ireland champions Loughgiel and Cushendall clash in the Antrim decider for the fifth time this decade. Loughgiel have won the last four. Joe Fortune’s Ballyboden St Enda’s and Anthony Daly’s Kilmacud Crokes meet again at Parnell Park after extra time wasn’t enough to crown a Dublin champion last weekend. Kilkenny great Henry Shefflin swapped his hurl for the sideline this season and has led home club Ballyhale Shamrocks to the county final at the first attempt. The record six-time All-Ireland winners last lifted the Tom Walsh Cup in 2014 but opponents Bennettsbridge are aiming to, eh, bridge a 47-year gap. The Bridge were a junior club as recently as 2014 but have been on a dramatic upward curve since, winning back to back All-Irelands at junior (2015) and intermediate level (2016). They have county men Rob Lennon, Enda Morrissey and Liam Blanchfield in their ranks. Ballyhale needed an injury-time late goal from Evan Shefflin, Henry’s nephew, to get past Erin’s Own Castlecomer in the semi-finals and will need a big performance from All-Star nominee TJ Reid to hold off the newcomers. There are also two senior provincial ties. Slaughtneil may have missed out on a remarkable double treble of Ulster titles when they exited the Derry football championship but they can still set up a three-in-a-row shot in the hurling if they get past Down’s Ballycran. The quarter-final in Munster pits Ballygunner, who broke Abbeyside hearts to seal five-in-a-row in Waterford, against Cork’s Midleton. Midleton were beaten by Imokilly in the county final but divisional sides cannot compete in the provincial championships. The Gunners have lost four Munster finals since their sole success in 2001 and will be targeting a long run this winter.